Thank you for your interest in Montessori Center school. Montessori Center School has served children ages 3–6 for more than 25 years, offering an authentic Montessori program in the unique environment of a restored horticultural ranch. Our teaching staff are college graduates with intensive training and certification at the graduate level. At Montessori Center School, we understand young children’s natural curiosity and sensitive learning periods. Our classrooms engage children’s hands and minds with inviting learning materials, and our highly qualified teachers use skilled observation to offer activities that meet each child’s intellectual and emotional needs. Nothing substitutes for a personal visit. Please call Rosanne Galluzzo, Assistant Director, at (602) 678-4470 to schedule a tour of our school, and please bring your child along! From the first day your child walks onto the Montessori Center School campus, he or she will encounter a wealth of inviting learning materials and a true sense of having “all the time in the world” to explore, alone or with new friends. The teacher’s respectful guidance provides a secure foundation for learning driven by your child’s interests and curiosity. At Montessori Center School, the indoor and outdoor environments connect seamlessly. Nature comes inside in the form of flowers to arrange, small animals to care for, and classroom plants to nurture. The outdoors is an extension of the Montessori classroom, where children can collect rock specimens to study or leaves to identify. Fresh air and sunshine inspire big work: digging in the garden, caring for our sheep, climbing on the play equipment—all in the company of good friends. The natural environment rewards patience with glimpses of colorful birds and butterflies. It affords endless exploration and discovery as well as a lovely setting for a community meal and sing-along. Above all, it provides daily opportunities to grow in responsibility, independence, and love and respect for all living things. Montessori Center School’s programs are year-round, with tuition paid monthly. Children may be enrolled at any time during the school year. 8:30 a.m. to 12:45 p.m., five days a week. The four core curriculum areas—practical life, sensorial, math, and language—are enhanced by cultural studies including music, art, and geography. 8:30 a.m. to 3:30 p.m., five days a week. The full-day program lengthens the school day for the older children and allows them to work on more advanced projects with others their own age. Children in need of before- and after-school care can benefit from this program conducted on site by trained staff. Available 7:30 a.m. to 5:30 p.m. at an hourly or flat monthly rate. Optional after-school offerings include yoga, Spanish, Chinese (Mandarin), chess, and nature study. The Montessori Center School, Inc., was established in 1985 to complement the work of the AMI-affiliated teacher training institute of Arizona, Montessori Education Center. 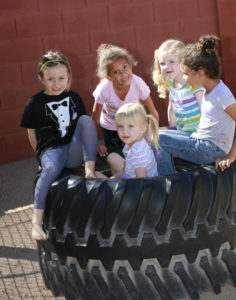 The Montessori Center School is an Arizona corporation, registered by the Department of Child Care. Admission is open to all regardless of race, creed, color, or national origin. The school is directed by Nimal Vaz, M.Ed., AMI Diploma, state certified for K–12 special education. Ms. Vaz was an AMI teacher trainer, examiner and consultant for 25 years and has taught and directed Montessori schools globally for over 50 years.